A fast car in a straight line is no good if it can't stop. Stock braking systems were never designed to cope with the huge power gains and suspension upgrades some modified cars have. In order to improve stopping power and reduce brake fade, Autopassion supplies EBC Brakes. EBC are manufacturers of award winning brake components and are famous for their high performance EBC Greenstuff Kevlar brake pads. 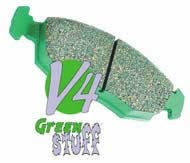 EBC's durable Greenstuff can handle up to 650 degrees C, yet can deliver strong braking performance from cold. The unique non-ferrous Kevlar compound of all EBC brakes means that brake dust is reduced. Another benefit being extended disc life due to lower operating temperatures. For more serious road/track use, EBC makes their Redstuff. This compound is stable up to 750 degrees C and shares the same benefits as Greenstuff. For the full racecar set up EBC Yellowstuff and Bluestuff, the ultimate brake pad material. Both are stable up to 900 degrees C, though Bluestuff is 2 to 3 times longer lasting in endurance racing. EBC has a full catalogue listing for most Japanese, European and Australian cars. EBC also supplies high alloy content brake discs in standard, slotted and slotted/X-Drilled. EBC's brake discs are designed to work perfectly with EBC Kevlar Pads, though they are also compatible with other makes. Contact Autopassion for further details on EBC Brakes. HEL Brakes Hoses use the best quality stainless steel fittings swaged onto hard drawn stainless braided Teflon; the outer coat is then PVC coated during manufacture. HEL Brake Hoses are pressure tested to 4000psi (275 bar) after assembly - keep in mind that maximum pressure inside these hoses, even under extreme braking, will rarely exceed 1030psi (70 bar). HEL stainless brake hoses are recommended for any high performance car and full racecar. Their advantage is tremendous durability, improved feel and quick response braking. Braking response (time between pedal pressed and car slowing) is much reduced because HEL brake hoses do not expand like the stock rubber items - so there is no time delay waiting for the brake hoses to take the slack. Braking feel is improved because there is a more solid and direct link between the brake pedal and brake calipers. HEL brake hoses are LTSA Approved in New Zealand and come with the required certified paperwork for road cars. The hose kits are available in silver, black, blue, red and yellow. For further details on HEL please contact Autopassion. Clutch Systems - Like any stock component in your car, the average clutch cannot withstand the extra power and torque of a modified engine. Add to this the more aggressive driving style of the enthusiastic racer and you can imagine that your standard clutch will soon be broken. Autopassion supplies replacement heavy duty, ceramic and Kevlar clutch kits from Exedy Extreme. The kits range from heavy-duty organic full-face clutch plates with heavy-duty covers and bearings, which are used on performance streetcars and club racing cars. For highly tunes racecars with more than 350bhp we recommend heavy-duty single plate puck style ceramic kits with sprung centres. And if your car has a massively modified engine (say 500bhp+) a twin or triple plate system is more appropriate. Exedy clutches are beautifully made to the highest standards and are comfortable to use compared to other performance clutch systems.